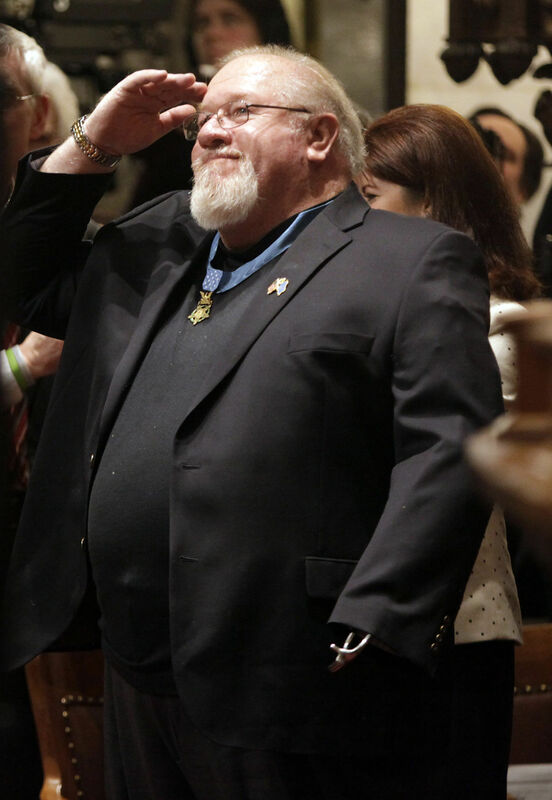 Medal of Honor recipient Gary Wetzel is recognized before Wisconsin Gov. Scott Walker's State of the State address at the state Capitol in Madison in 2014. 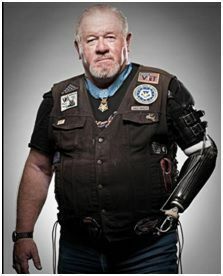 SOUTH MILWAUKEE — I am a proud military veteran, Medal of Honor recipient, American Legion member and retired operating engineer. Though retired, I am an active advocate for veterans, their medical care, job opportunities and family sustaining wages. Specifically, I am concerned about a repeal of Wisconsin’s prevailing wage law and the negative impact it would have on veterans. Wisconsin legislators are threatening a rollback of the prevailing wage law that would mean a significant cut in wages for anyone — union or non-union — working in construction. The Wisconsin American Legion understands the seriousness of the situation and recently passed a resolution calling for veterans to receive employment preference for projects that receive state, county and municipal grants and contracts. It also calls for wages to be paid at a family-sustaining level (as set by federal guidelines mirroring our state prevailing wage law) to prevent the financial exploitation of veterans. When I came back from the Vietnam War, I was one shot-up man. Almost exactly 49 years ago, our helicopter was shot down near Ap Dong An, and I lost one of my arms. My crew members were either dead or soon-to-be dead, because the helicopter was on fire and the enemy had us pinned down. I grabbed the ’copter’s machine gun and returned fire with my one good arm. I survived that day with a few others and was awarded the nation’s highest award for valor by President Lyndon B. Johnson. When I came back, a career in the operating engineers offered me training, a community and a good living. Transitioning to civilian life was hard, but having a job to support a family helped make that transition easier. I operated heavy machinery with one arm for 40 years. In Wisconsin, veterans make up 8.3 percent of the construction workforce, which is significantly higher than the percentage of veterans in the general workforce. Employment in the construction industry is projected to grow by over 14,000 jobs between now and 2022. In other words, Wisconsin has a real opportunity to put veterans to work in an industry they already gravitate toward. That’s why efforts to repeal Wisconsin’s prevailing wage law are so troubling. The law was written to promote better workmanship, higher productivity and efficiency, and more local hiring on government-funded construction. Prevailing wages help support the largest system of privately financed vocational training in the country — skilled trade apprenticeship programs. These programs enable those interested in construction to acquire the training they need to build a career in the industry. Opponents of prevailing wage policies argue that repeal saves money. They claim a low-skilled, undertrained construction worker making rock-bottom wages will produce the same product as a higher-skilled, professionally trained craftsman. I can tell you from experience that is simply not true. What low-road contractors save in labor costs never materializes as savings for taxpayers. That’s because taxpayers end up footing the bill for reduced worksite efficiency, higher injury rates, and the prospect of needing to go back and fix work that wasn’t done right the first time by a contractor who by then is long gone, resulting in higher material and energy costs. This is not a union versus non-union issue. All workers in the construction industry benefit from prevailing wage laws. Prevailing wage laws simply ensure workers building our vital infrastructure receive a fair wage. If you cut construction worker wages by repealing prevailing wage laws — which everyone agrees will happen if prevailing wage laws are eliminated — veterans will be harder hit because veterans are more likely to work in the construction industry. We are veterans who want our voices heard and have a deep desire to continue proudly serving this great state and country by building safer roads, schools and communities for our families. Let us send a loud message to our legislative leaders — protect job opportunities and wages for our veterans. Wetzel, of South Milwaukee, is a member of Legion Post 434 in Oak Creek. Each attempt at a long-term solution has failed.